Flipper boats are built by the well-known Bella stable, which has been in the business of boat building for more than 40 years. 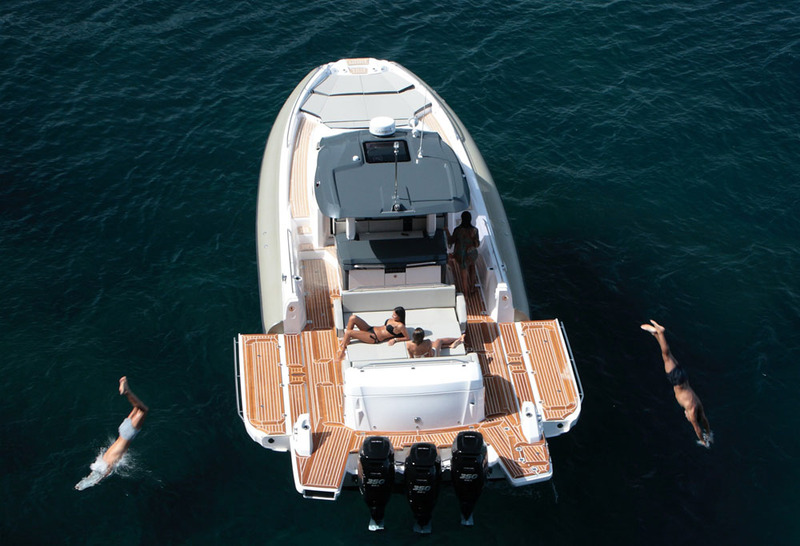 And while the current Bella fleet comprises three brands and a spread of boats from five to 10 metres in length, the Flipper line-up sits at the smaller end of the spectrum, with all nine of its craft coming in at less than 7.5 metres. 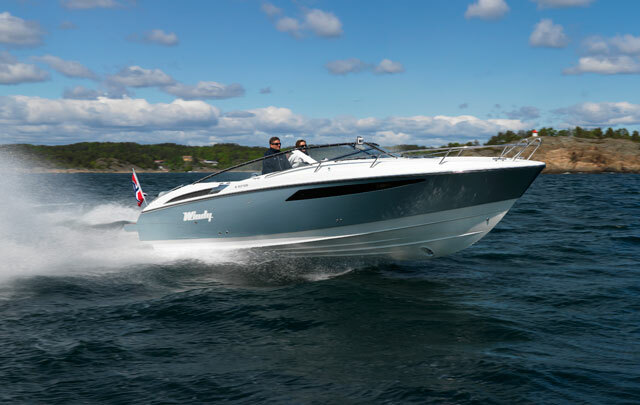 Of those, only four are Hard Top boats and, at 5.16 metres in length, the 520HT you see here is not just the smallest of the Hard Tops but also the smallest in the entire Flipper range. 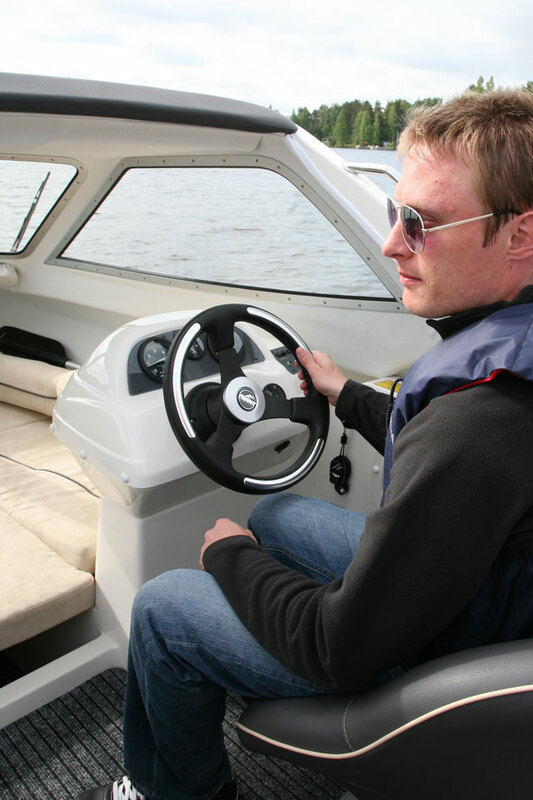 Obviously then, it has a lot of work to do if it is to satisfy the increasingly varied needs of the modern boater. It’s an incongruous thing, seeing two grown men buzzing along at the helm of a boat as small as this - particularly as the forward structure seems to frame them rather comically like overgrown sardines in an undersized tin. And yet as a Hard Top, it has serious pretensions and a serious array of tricks to accomplish. With just 17 feet to play with, the emphasis has to be on useable accommodation, maximisation of inboard space and secure (rather than extreme) driving dynamics - and when you step on board, you can see that the designers have adopted precisely this approach. You get an open double berth under the forward structure and a fairly conventional five-man cockpit behind, with two helm seats and a three-man aft bench. This accommodation is all neatly wrapped in secure stainless steel, right from the aft ladder to the robust cleats, the cockpit handrails and the huge foredeck rail that runs straight off the roof to a peak above the anchor locker. You also get a permanent swing-up canvas mechanism on the backrest of the aft bench, which can be very quickly deployed. With this in place, the unbroken space of the forward berth is supplemented by the covered aft cockpit to generate a very comfortable sheltered area measuring about ten foot by six. There’s not enough room to stand up straight in here, but as a place to hide from the rain or take refuge overnight at a sheltered anchorage, it’s a very serviceable area. On the downside, the designers’ attempts to maximise internal space mean that the walkways to the foredeck are extremely narrow - narrower in fact than the width of a foot. It makes progress along the sills toward the foredeck very awkward, particularly as your presence on so wide a point causes a boat of this size to list significantly toward the shifting centre of gravity. There is of course a remedy - namely, an opening section in the centre of the screen. Not only would this allow you to reach the foredeck more easily but it would also enable fresh air to permeate the helm space and help minimise any reverberation of engine noise in the enclosed cabin. The trouble of course is cost. 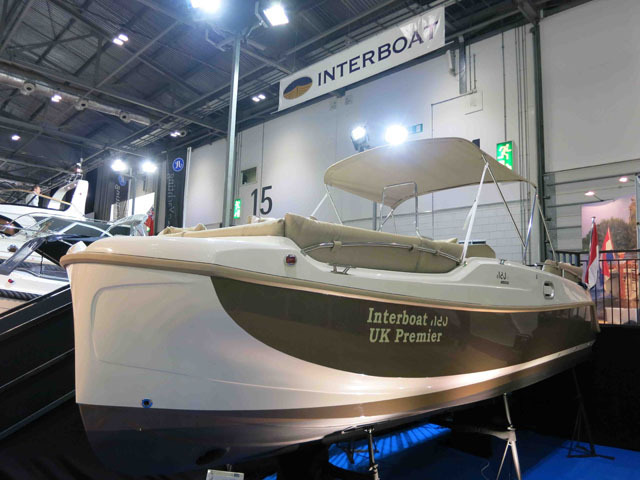 This is a modest Hard Top leisure boat in terms of looks, size and facilities, so substantial changes of this kind would be likely to damage the accessibility of that price tag. Walkways aside, there is some very clever thinking in action here. For instance, the GRP stanchions for the roof are angled to a high point about two feet forward of the driver’s head, enabling both helmsman and navigator to see sideways without compromising their protection from the elements. And the upholstered strip along the leading edge of the roof is another useful feature, eradicating any chance of head-butting a sharp GRP edge as you make your way into the cabin. And then you come to the helm console itself, which stands rather proudly on a small pod, arching up over your knees to present you with the wheel and a couple of dials. It frees up lots of space that might otherwise be wasted by the footprint of a conventional console - and while it does limit the space available for dash equipment, if you want any additional electronics, they can simply be top-mounted to the right of the wheel to avoid inhibiting access to the cabin. Of course, the standard 520HT package is not exactly generous, but it is impressively practical, with the cockpit canvas, the windscreen wiper, the bilge pump and the cockpit cushions all making it on board. 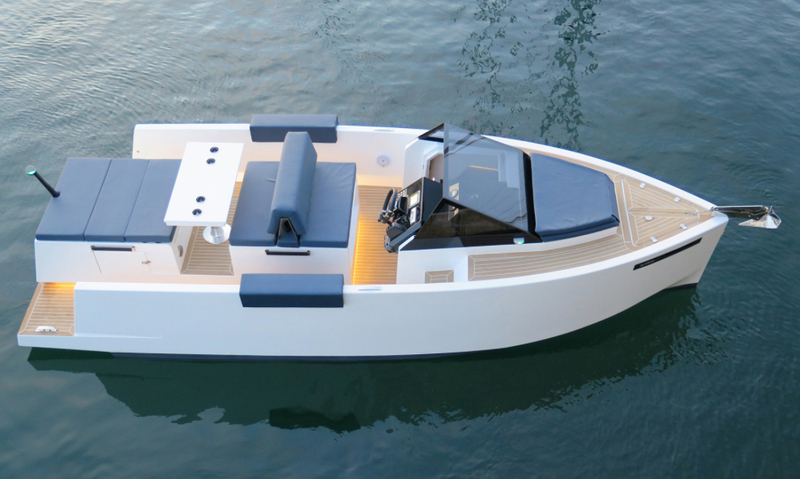 As for the options list, it would certainly be wise to add a compass but beyond that, this is a boat that embraces simplicity - not just in the design but also in the buying process and the ownership experience, so if you want all the bells and whistles, you might be best looking elsewhere. When you’re crawling along in displacement mode, the forward GRP structure does force you to stoop a little to see what lies in your path but, once underway, the boat’s running attitude sees the roof lift clear of your field of vision, giving you an impressively open view. As for the dynamics of the helming experience, they are also pretty good. As you put the throttle down, the revs rise, the nose lifts a touch, the Flipper scoots up onto the plane and the pace increases at a decent rate. 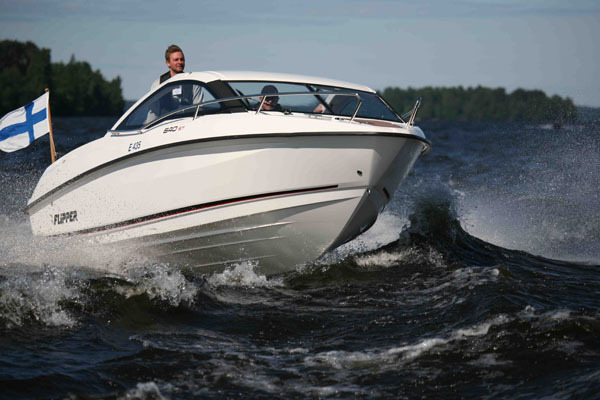 Of course, in a lively or confused sea, you have to use the boat’s agility to nip between wave shapes, adjusting trim and throttle as the seascape demands, but that’s only to be expected. This is a small, relatively flat-water craft, with lots of shallow-hulled buoyancy to maximise inboard space, so she was always going to need a bit of proactive input from the helm to keep her in shape. Having said that, there’s not an enormous amount of power on tap from the 60hp outboard, so spurting the boat over troughs in an instant is not always possible. 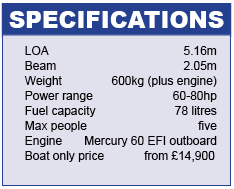 In fact, at around 30 knots, all the power I have is being used to the utmost, so while the 60hp Mercury outboard does a very decent job in most respects, it might be worth taking a look at a unit closer to the 80hp top end rating. While that will obviously add a few hundred pounds to the price, it should give you far greater capacity to tow a skier or to elevate the nose with a quick squirt of the throttle. 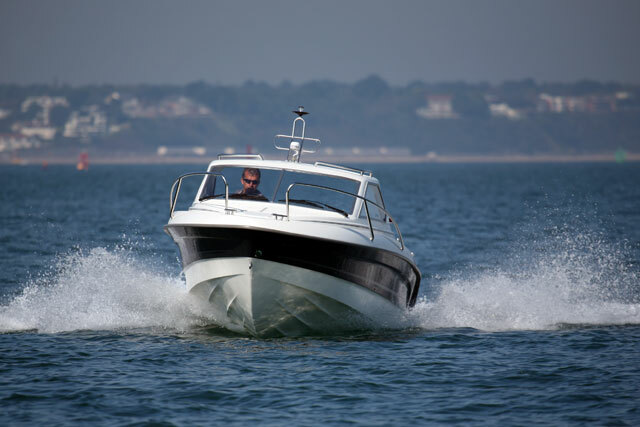 In the right conditions, the 520 HT is a secure, economical and easygoing boat that is well able to treat a small family to a life of estuary and coastal adventures. It comes with a very serviceable sheltered bed, a set of canvas covers and the promise of affordable running costs and robust residuals. 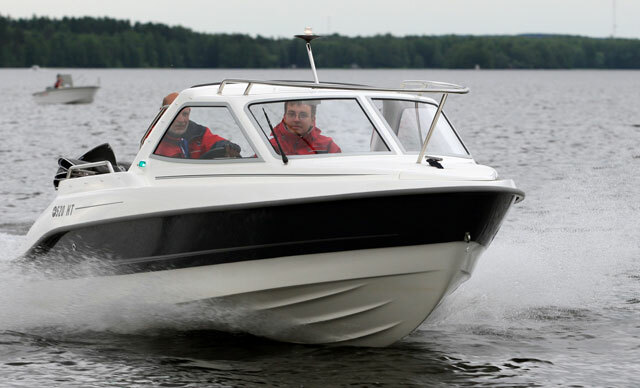 With a deep secure cockpit and credible dynamics, that makes the 520 HT a very worthwhile little leisure boat indeed. The Flipper is available from T L Harvey.